Beginning July 1, 2017, livestock dealers and packers in Vermont need to comply with new bonding requirements. Under the new requirements, applicants for a dealer or packer license will need to present a $10,000 livestock dealer bond in order to obtain the license. Read on for an overview of the new bonding requirements! 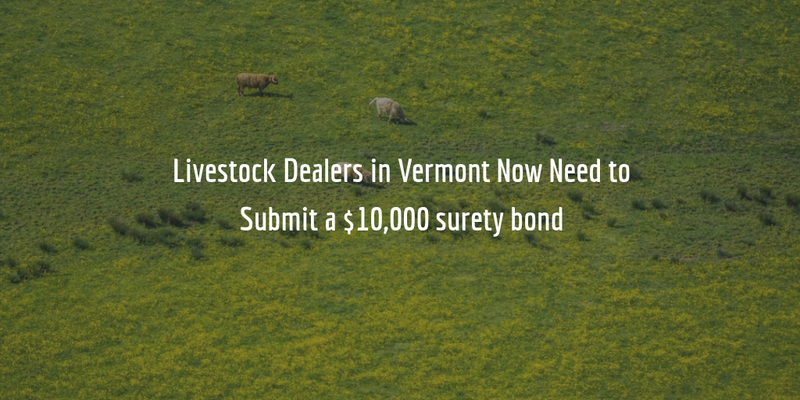 As of July 1, livestock dealers and packers in Vermont are required to submit a $10,000 livestock dealer bond to the Vermont Agency of Agriculture, Food and Markets in order to remain licensed or to renew their license. Previously dealers and packers were not required to post a bond in order to obtain a license. The change in bonding requirements was passed in early May with Vermont House Bill 497. Dealers and packers are also required to pay a $175 licensing fee, whereas livestock transporters have to pay a $100 fee. The purpose of the livestock dealer bond is to guarantee that dealers and packers will comply with the provisions of the Vermont Statutes and in particular those that regulate their business. If they should violate these statutes, the bond provides protection to the state by making available financial compensation up to the full amount of the bond. Apart from instituting changes to the bonding requirements, the House Bill also reviewed the health requirements and care standards for animals used in agriculture and introduced some minor changes. To get your surety bond, you do not need to come up with the full $10,000. This is the full bond amount, the so-called penal sum, which is the amount of compensation which may be extended to claimants. The cost of your bond is only a small fraction of the full bond amount. How high or low your cost is is determined by the surety on the basis of your personal credit score and other financials. The higher your score – the lower your rate. For an applicant with a high score that may mean a rate between 1% and 2.5% on their bond, or as little as $100. The exact cost of your bond is determined once you apply for your bond. To get a free quote on your bond, simply fill out our online surety bond application form. There are no obligations attached to submitting the application. Once we receive your application, we will contact you with your quote and further details, if you should decide to get a bond. If you have any questions regarding the bonding requirements, just call us at 877.514.5146 to speak to our bond agents. We will be happy to help you out!